Loved as Kim’s husband and friend, adored father to Jessie (Bernie) Agnew Restauro, Laura (Mike) Johansen, Michael (Laura Ann) Agnew, and much-loved papa to Maya, Liv, Ellie and Mateo. 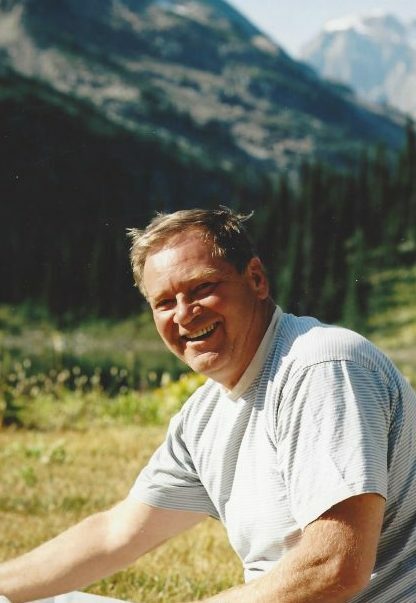 Nick passed away peacefully in Bragg Creek on Monday, May 28, 2018. Born in Calgary and a lifelong resident of Bragg Creek, Nick was the eldest son of Fred and Doris Agnew. He will be held dear by his sister Susan (Paul) Kartzke, sisters and brothers-in-laws, numerous nieces, nephews, extended family and friends. Nick was a cornerstone of his family through joyous and difficult times. Unconditional love and strength paved the way to create a strong, beautiful loving family that worked and played together. Nick was a multifaceted man who enjoyed many disciplines, one of his favorite was fly-fishing, and for nearly a decade he was a regular on the Bow River. His tenacity, passion, optimism and fierce independence are hallmarks of his character, even when facing the challenges of living with MS and cancer. The family wish to extend sincere appreciation for the wonderful care provided by Dr. Nikki Schiebel and Con Schiebel, Dr. Annalise Noordman, Liz Ann Jonassen, Dr. Scott Jarvis and Pure North Synergy. Aaron Caldwell, an inspiring fly fishing guide and ‘second son’ was instrumental in enabling Nick to fish the Bow River. Countless friends provided years of support and laughter. Please join us on Saturday, June 23, from 1:30 pm to 3:30 pm for a Celebration of Nick’s life at the Bragg Creek Community Center, 23 White Avenue, Bragg Creek. Tributes start at 1:30. In lieu of flowers, please consider making a donation to Juvenille Diabetes (JDRF Canada) or Lupus Canada. Dear Kim, Jeff, Laura, Mike, and extended Agnew family. Nick is going to be so missed and especially I’m sure by those grandchildren that meant so much to him. Henry and I are so sorry to have lost such a great near and dear long time friend. We are so fortunate to have so many great memories embedded in our hearts (as well as videos and pictures of the wonderful times we have shared with your whole family) that will provide some solace. Henry and I look forward to gather with old friends and your family to celebrate a great life that he enjoyed with all of you. God Bless and keep you and give you the strength to go forward like Nick would want you to. Kim, So sorry to hear of Nick’s passing. I didn’t know anything about his cancer but I do understand how hard that can be. I hope you have many good friends to help you in your new journey. I am so sorry to hear your sad news. I have admired your resiliency from afar. I pray you will find comfort in cherished memories and strength with family and friends who surround you and love you. Nick and I met many years ago, but it took until more recent times for our relationship to grow into a closer friendship. I’m sorry it didn’t happen earlier. Anyone who knew Nick will understand when I say he personified kindness, connection, resilience, humour, commitment, and many of the other characteristics of someone you want to spend time with. One of the best things which can be said of anyone is that they brought positive change to the world they lived in. That was Nick. He left many people in his life better citizens of this world because of who he was. Laura and family:sorry for your loss. I only met your dad less then a handful of times close to a decade ago but his warmth and charisma were easily felt. Jessie, We offer you our sincere condolences. We are sorry for your loss. May his gentleness and kindness continue to live on in your heart. Laura and family, I am so very sorry to hear of your fathers passing. God will guide you and be there for you during this difficult time. You are in my prayers. Sincerest sympathy to all of Nick’s family and friends. My heart goes out to you as I remember only a small but impactful taste of Nick’s beautiful heart, he’s contagious smile and inspiring wit. I have always appreciated the opportunity to have spent the time I did with Nick and family. Times I remember frequently and will forever hold a place in my heart and soul. Love and warmest regards, Kari and family. Kim, Jessie, Laura, Mike and family- this picture of Nick certainly shows his true personality and wonderful smile. He will be missed by many but has left a lasting memory on our hearts. Nick will be remembered by our family as an incredible spirit who shared his love for life with everyone who was fortunate to know him. Our thoughts and prayers are with you all as you move through this difficult time. Love to all, the Shea family.